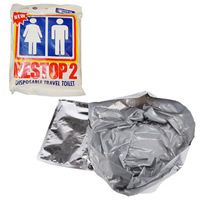 The Restop 2 Mylar Toilet Bags use a patented "bag within a bag" design to safely contain and neutralize human waste. Restop contains the odor as well as the waste. The outer bag is a Mylar gas-impervious bag. The same polymers and deodorizers used in the RS1 are inside, with a slightly different set of enzymes for solid waste. The Restop 2 system contains the odor as well as the waste, providing a user-friendly and pleasant means to pack out solid waste. Ample toilet paper and a moist antiseptic towelette are included.